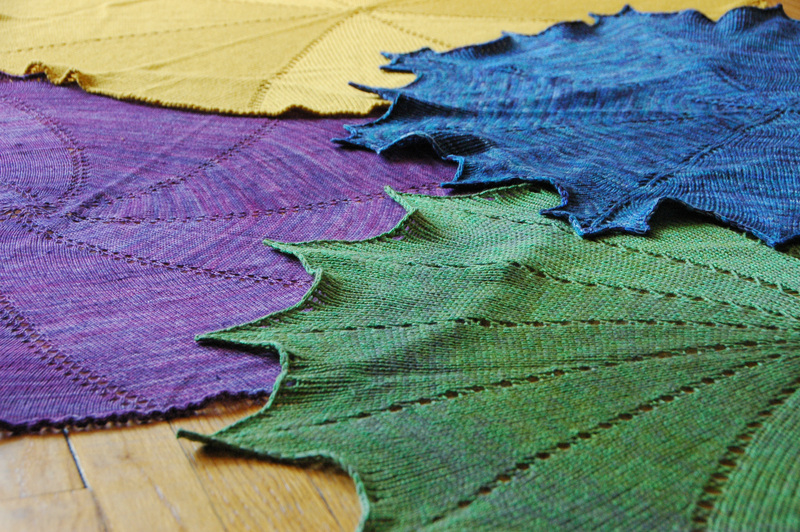 This is a small excerpt from Shawls to Play With, the shawl collection I’m working on. There are four shawls in the collection (named Gratia, Xylia, Yuki, and Idril) all of which are designed around elegant simplicity. The shawls in this collection are all variations on traditionally shaped, knit in the round, shawls. The traditional shawl shapes being, the wedge circle, the concentric circle, the pi circle, and the center out square. Gratia is a variation on the concentric circle, Xylia on the wedge circle, Yuki on the center out square, and Idril is a variation that falls somewhere between the concentric circle and the wedge circle. Why are there multiple ways to knit a flat piece of fabric in the round? Because all circular shawls are simply variations on each other. They all follow the same ratio of stitches increased to rounds worked, 8 stitches increased on every other round, but each shape has the increases arranged in a slightly different configuration. For the shawls in this collection, I took those traditional increase placements, and the ratio of stitches increased to rounds worked, and played with them. This is an excerpt from Shawls to Play With, which, with a bit of luck, will be making it’s first appearance later this week.